Crazy or genius? Can wind turbines tap and sap the energy in hurricanes? Is it possible to deflate hurricanes by wind energy? : Huge wind turbines off the coast of Denmark show a small-scale version of an off-shore wind farm that could sap the energy of hurricanes and tropical storms.Courtesy Leonard G.A new study claims that positioning large, off-shore wind farms in the path of oncoming tropical storms and hurricanes can reduce the damage those storms inflict. The extra electricity they produce is just an added bonus. The study's findings contend that "tens of thousands of turbines can lower a hurricane's wind speed up to 92 mph and reduce its storm surge up to 79%." But is it realistic to think that such a big wind operation could actually be built? Currently there are no operating water-based wind farms in the United States. The largest off-shore wind turbine sites being considered for construction have about 200 turbines planned. Those facilities are being planned off the coasts of Texas and New England. There are small-sized off-shore wind plants in Europe and China. But if a huge wind operation was feasible, the study estimated that such a plant would have saved a lot of damage in the 2005 Hurricane Katrina in New Orleans. Somef 78,000 wind turbines — each 50 feet tall — could have slowed Katrina's wind speeds up to 78 mph and cut its storm surge up to 79%, the report from Stanford University said. What do you think? Is this an idea ahead of its time? Is it pie – make that blowing pie – in the sky? Share your thoughts here with other Science Buzz readers. 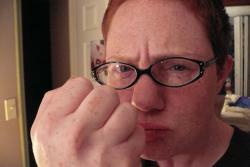 Next time you look at the clouds, shake your fist and yell at those jerks for making our lives difficult. You might look crazy, but somebody needs to tell those fools. While it's relatively easy to model temperature changes over the last century thanks to detailed records, clouds are more tricky to understand because we don't have a similar history of cloud observations, and also because they are ornery. So in order to understand how clouds work, scientists are building a body of evidence to model cloud behavior and help show how clouds will impact our weather as well as our climate in the future. I believe they also plan to show those clouds who is the boss of them. Like a child running loose in a toy store, hurricanes have always been difficult to predict because they can unexpectedly change direction. This confounds plans for evacuation, leading some people to leave areas that are never hit, leading others to stay put and potentially face nasty weather because they don't trust the meteorologist, and leading meteorologists to keep Advil in business. But since the 90s, our ability to predict where hurricanes will make landfall has become twice as accurate. This new prescience is due to the development and use of more accurate models of how clouds work, which is in turn due to better understanding of cloud dynamics and faster computers. How about that, punk clouds? "While we pride ourselves that the track forecast is getting better and better, we remain humbled by the uncertainties of the science we don't yet understand," Schott said. "This is not an algebra question where there's only one right answer." -Timothy Schott, tropical cyclone program leader for the National Weather Service in Silver Spring, Md. Despite being a "forecasting nightmare," Earl ended up hitting about where it was predicted to go. This means that the right people have been evacuated to avoid injury and fatality. That's right, stick your tail between your legs, Earl. Short-term events such as hurricanes and other storms are difficult to predict, but climate change is a whole other world of uncertainty--again, thanks to those uncouth clouds. Climate scientists are developing new tools, such as satellite technologies that show how much light different cloud types reflect and models that demonstrate localized cloud processes. These approaches look specifically at certain groups of clouds and their patterns of change to add detail to older, larger models that look at climate over larger scales. The problem with the older models is that they have a low resolution that doesn't accurately represent clouds because the clouds are smaller than they can show. Think of it like Google maps--at the beginning, you're looking at the entire planet, or a whole continent--this is similar to older, low-res climate models. The new models are like zooming in on a city--you can see bus stops, restaurants, and highways. But you have to zoom out to see how these small pieces relate to the larger surroundings. In a similar way, the new high-res models are helping to inform older models--this type of work is called multiscale modeling. Researchers at the Center for Multiscale Modeling of Atmospheric Processes (CMMAP) are developing this exact type of model. You can read about their advances here. This work is important because it brings insight into questions about whether clouds will reflect or trap more sunlight, which can have a big impact on the rate of global warming. It also helps us understand whether geoengineering projects that alter clouds will really have the intended effect. Plus it's just one more way we can pwn clouds. Ana, Bill, Claudette, Danny, Erika, Fred, Grace, Henri, Ida, Joaquin, Kate, Larry, Mindy, Nicholas, Odette, Pete, Rose, Sam, Teresa, Victor and Wanda. So far this year we're up to Claudette. Ana is old news already with the National Hurricane Center announcing yesterday that the storm had weakened so much they were no longer tracking it. Claudette is also weakening, but it had the distinction of being the first tropical system to reach land yet this season. Third in line is Bill, who has already become a category 3 hurricane. Follow Bill’s progress here. The National Oceanic and Atmospheric Administration (NOAA) has issued its Atlantic hurricane season forecast. The prediction -- "near-normal" -- fits pretty well with the forecasts from AccuWeather, Colorado State University, WSI Corporation, and the Weather Research Center. What does "near-normal" mean? NOAA is predicting 9 to 14 named storms, with 4 to 7 hurricanes, and 1 to 3 major storms (category 3 or higher on the Saffir-Simpson scale of storm intensity). But storm prediction is a tricky business. More rainfall over West Africa, warmer sea surface temperatures, and reduced wind shear could encourage more storms. An El Nino pattern in the Pacific or cooler ocean temperatures could discourage them. NOAA will issue another prediction in August, just before the usual peak in the hurricane season. Researchers at Florida State University have found that hurricane activity, both in the North Atlantic and globally, is at a 30-year low, and the trend is expected to continue. 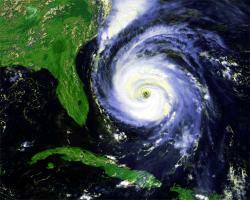 Many people viewed the disastrous 2005 hurricane season as evidence of global warming. Others have pointed to the calmer-than-normal years since then as evidence that global warming is just hype. Both sides are wrong. Climate is about long-term trends. A single season -- or even a string of seasons -- is not enough to establish a pattern, especially with something as complex as weather. As the Florida report notes, further study is needed before we'll really know what's going on. 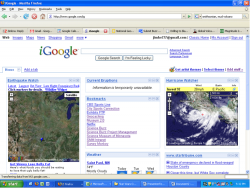 You can use StormPulse to track hurricanes, etc. Satellite image of Hurricane KatrinaCourtesy NOAAI just got an email from Scientific American with a link to a really cool grouping of web resources on hurricanes. 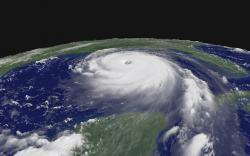 Check out the Scientific American Guide to Hurricanes here. Gustav was the seventh named storm in the 2008 Hurricane season, and we quickly have four more, including three in the Atlantic. Hanna has hit Haiti leaving at least 10 dead and could hit the East coast as early as Friday. It is currently a tropical storm, but forecasters say it could be back to hurricane strength again before making landfall on the East coast. Check out the storm track for this storm here. Ike is headed to the area of the Bahamas and could reach the area by Sunday. The area would then have been hit by four storms in a row, Fay, Gustav, Hanna and Ike. Check out the storm track for this storm here. Tropical storm Josephine formed today and hurricane center said it could near hurricane force by Wednesday or Thursday. Check out the storm track for this storm here. In the Pacific Karina is a new storm that at this point does not pose any risk to the West coast or other inhabited areas in the Pacific. My homepage: This is my homepage with a couple of the mentioned gadgets.Courtesy JoeIf you are interested in tracking hurricanes, typhoons, tropical storms, etc. there is a cool gadget available for your Google hompage (and probably others) that allows you to view, track and interact with maps that show the most current active of these tropical weather systems. Its an interesting way to keep up and monitor the systems - and remind yourself that they happen all over the world. The one I use is here but I am sure there are others that are similar. There are also gadgets for earthquakes, volcanoes and even one specific to world disaster photos. In 2005, Dr. Kerry Emmanuel, a climate scientist at the Massachusetts Institute of Technology, published a paper claiming there was a link between rising global temperatures and increases in hurricane strength. This year, Dr. Emmanuel has published another paper in which he reconsiders the evidence. He found that the models used to predict hurricane activity were not matching up with what was happening in the real world. 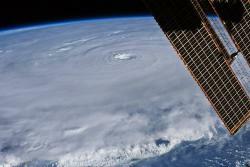 The link between hurricanes and global warming may not be as strong as originally suspected, or may not exist at all. This is precisely how science is supposed to work – examining evidence, coming up with theories to explain the evidence, testing those theories, and adjusting the theories if necessary. In another three years, Emmanual may write another paper showing that he was right the first time. Or that the whole hurricane-warming link is a dead end. Or perhaps some other conclusion. But the important thing is to keep looking, and to report honestly what you find. As economist John Keynes famously said, “When the facts change, I change my mind.” A good approach to any debate.